The weekend is here and so is the end of Week 1, today is Rosabelle’s day off and she will be collecting and writing all day to raise more funds. She also has a big evening planned to celebrate her first week. Rosabelle wakes up uncomfortable from lack of food, yogurt all the time just isn’t enough sustenance for an active sim. After eating a quick breakfast of yogurt, as always, she goes to the community pool at Desert Bloom Park to use the showers and then go collecting at the park. When she arrives her fun is getting low so she goes over to the chess tables at the park and plays a game with Travis Scott, she gains a logic skill point too. After a while of collecting Rosabelle’s fun need is very low and she is tense, playing that game earlier was not enough to raise her fun. 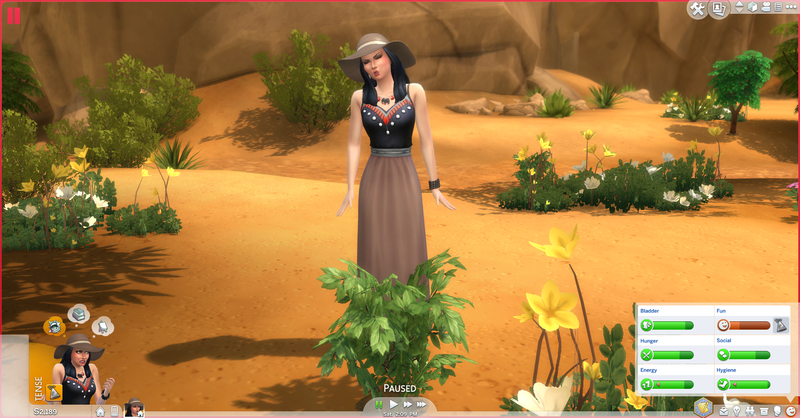 Rosabelle keeps one of every new harvestable that she collects at the park to possibly plant later. 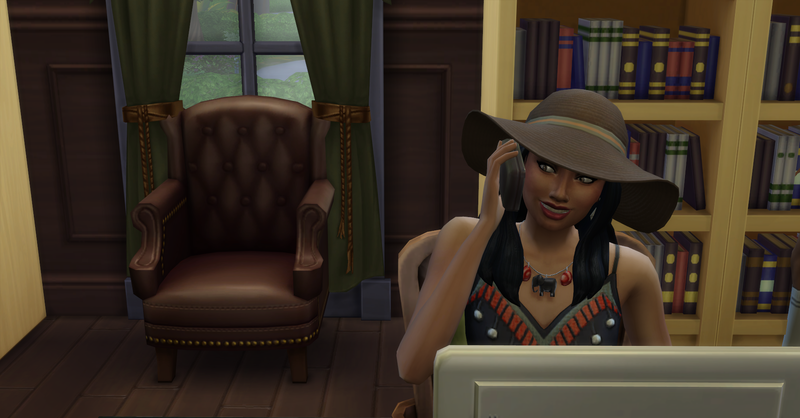 In order to work off some of that tension and raise her fun, Rosabelle heads over to the library to read some books and work on her writing. At the Library she immediate starts reading for fun and feels better right away. Rosabelle then uses the computer to practice writing for a while and gains another skill point. Rosabelle knows that she will not be able to achieve her goal of §1,000,000 simoleons in her family within her own generation, that means that she will need to start and family and have children to carry on her legacy. She was really disappointed not to see Pawel again today working at the Library when she was there, she has really started to enjoy their conversations together. And she thinks that he is the best option out of all the people she has met so far for a possible spouse. 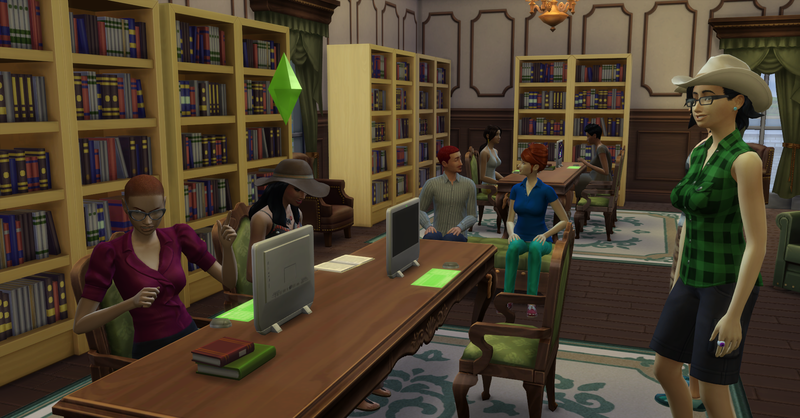 Rosabelle rings up Pawel and invites him to hangout with her at the library in order to get to know him better. 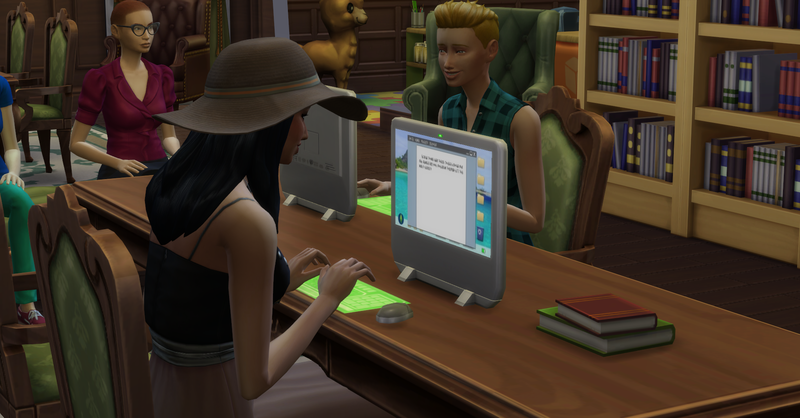 Pawel arrives at the Library to hangout a few minutes later, Rosabelle greets him and they start chatting away, then Rosabelle asks him a very important question to her. This is such a relief for Rosabelle, she would hate if the person she is really falling for was in another relationship, she decides to take a big risk and ask him out on a date with her that very night! 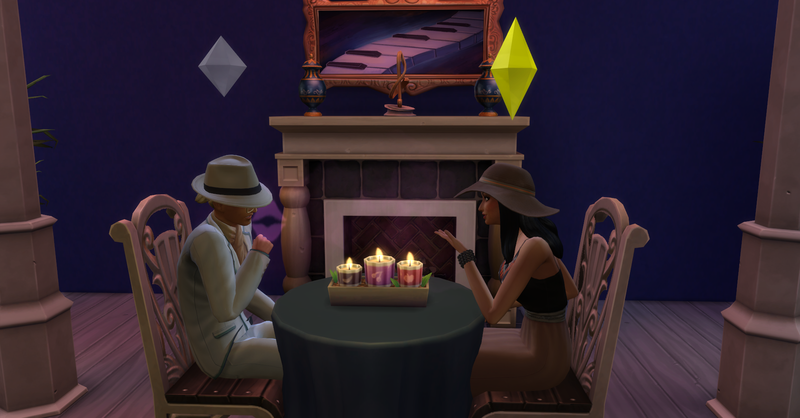 Rosabelle and Pawel go to the Blue Velvet Lounge, right down the street from the library, in Willow Creek. Rosabelle thinks that the lounge is a perfect first date location, it’s close to where they already are and it has a very casual and relaxed environment. She doesn’t want to scare Pawel away with too much romance right away. 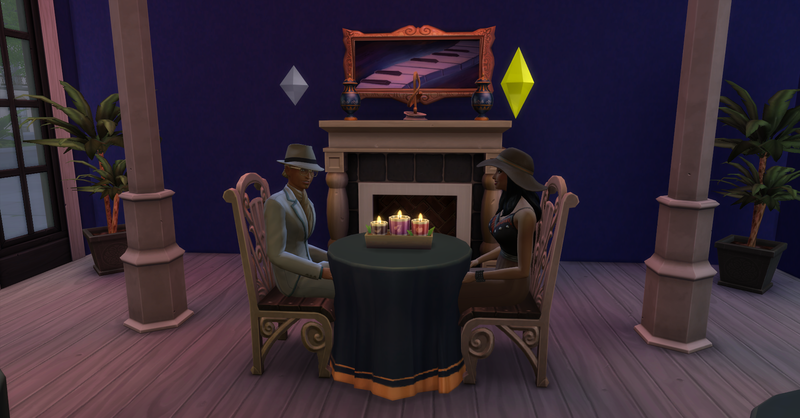 When they arrive at the lounge, Rosabelle wants to take a selfie with Pawel to commemorate their first date together. Doesn’t Pawel clean up nice for their date too! Once inside they choose a table. 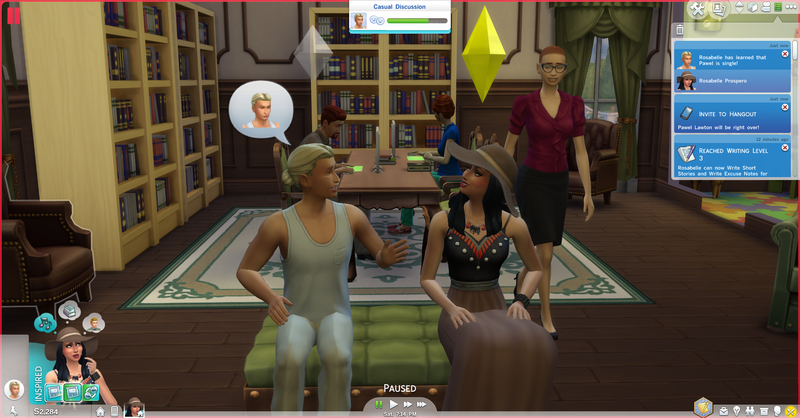 Rosabelle is being very flirty, she is making sure Pawel knows how she fells about him. She blows him a kiss! Rosabelle is hungry so she grabs some chips from the bar and her and Pawel continue their conversation. Pawel and Rosabelle become best friends during their converation! 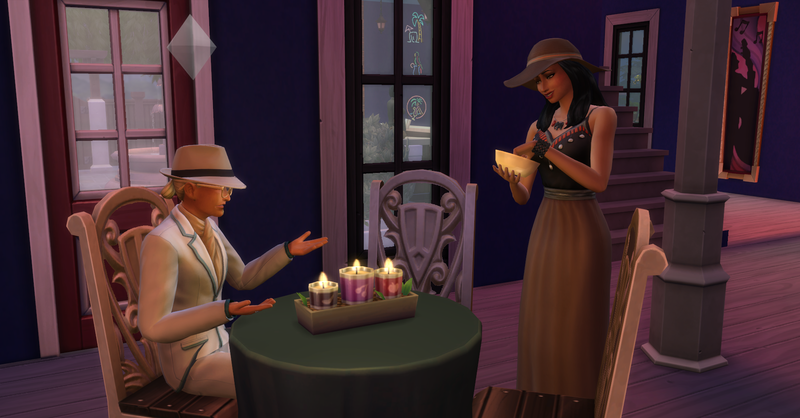 They go outside to the back patio for some more private time, without other sims interrupting and joining their conversation. 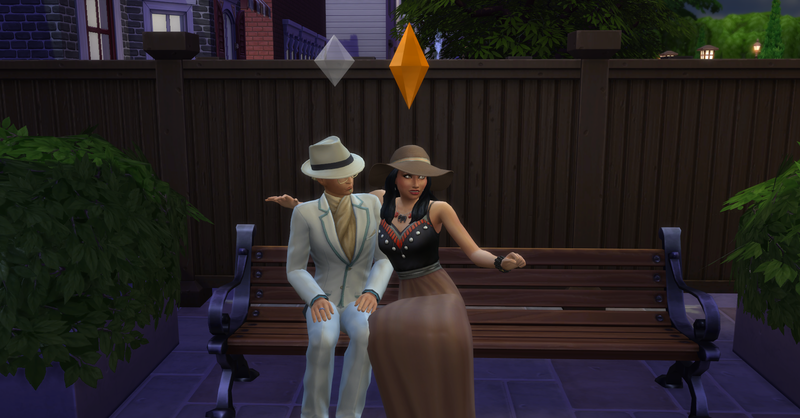 Out here Rosabelle gets up the courage to make a move on Pawel! Rosabelle yawns and stretches next to Pawel, he doesn’t know what is coming! She thinks that she can maybe sneak her arm around him. That was one smooth move, Rosabelle. Pawel seems very flattered and shy. They seem to really be hitting it off! 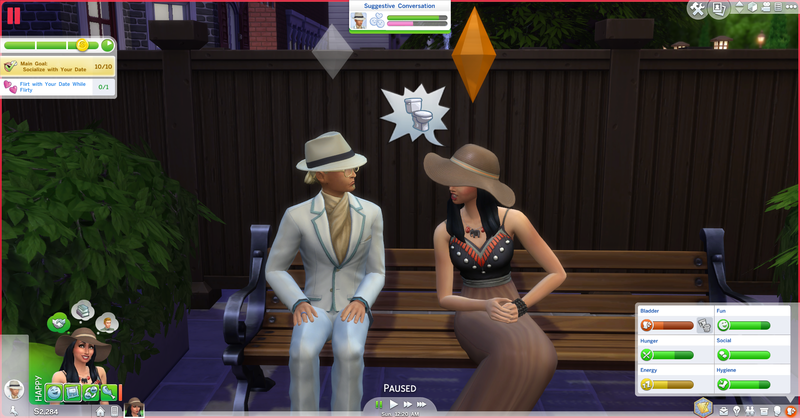 And Rosabelle ruins the moment by telling him that she really needs to use the bathroom. 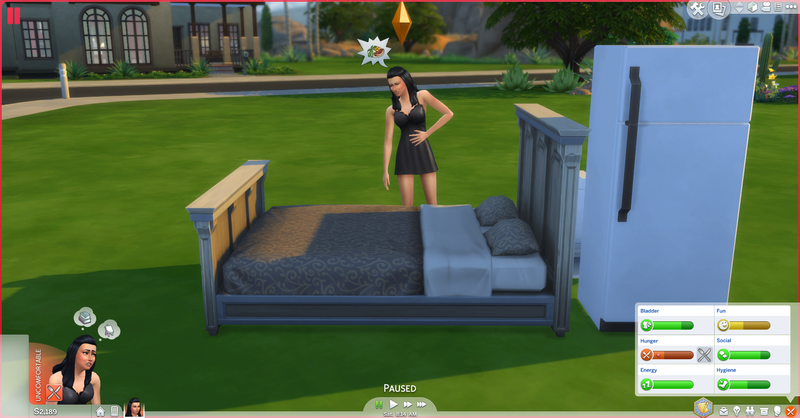 The date is almost over and Rosabelle has earned a gold metal for her date with Pawel tonight, the date ends while she is using the bathroom but Pawel is waiting for her outside by the fountain when she comes back from the bathroom. She earns the VIP bucket as prize for completing the date with a gold metal, she sells it for $245, her funds are now $2529. Back outside they share their first kiss together and Rosabelle thinks that he is the one! Rosabelle returns home tired but happy with the outcome of her date. She can’t stop thinking about Pawel and their first kiss together. She goes to bed when she gets home because she is tired from all the activity of the day. Check back soon for Week 2: Day 8 of our Challenge! I remember those early days (in a legacy) when it is a challenge just to find enough fun and manage all the needs! Yes, the first few days were ok but by the end of the week the lack of sleep (napping on benches only) and the lack of real food (quick snacks only too) had really caught up with her and she was feeling really uncomfortable all the time.